I pretty much have to credit almost all this work to my cooking genius friend Jimmy because my parents had decided four days prior that I would be making Thanksgiving dinner. This, of course, gave me no time to prepare since I had work the whole week but luckily a message on Facebook to Jimmy provided me with all the information I needed. Though it's after Thanksgiving and practically useless to post this up for you now, I figured it'd be a good reference for the future or any turkey dinners you want to make. Thanks to Duc for providing all the pictures and being my sous chef! 1 package salt pork (in strips), 6 oz. Hopefully you have defrosted your turkey. If not, you're going to need to. Come back to this recipe after that's done. Clean out the cavity of your turkey. You can put gloves on if you'd like but you don't have to for this next step. Loosen the skin of the turkey by starting at the tapered end of the breast and ripping the connective tissue between the skin and the flesh. It may seem awkward because you'll be sticking your hands all up under the skin but trust me, you'll want to do this. 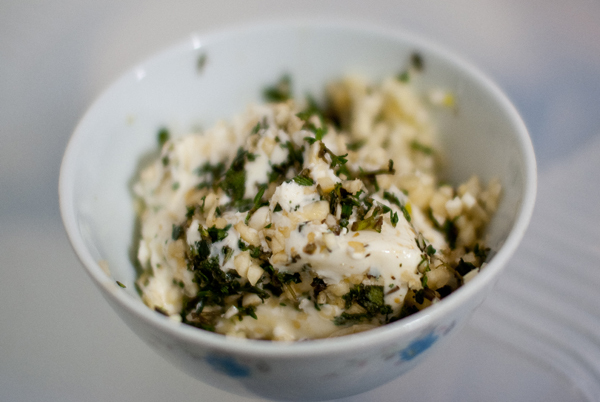 Mince about one third of your fresh herbs and 4 cloves of the garlic. Mix these into your butter by hand until it is evenly combined. Then rub this butter mixture all over the turkey's flesh underneath the skin. You'll probably also want to massage your turkey to make sure the butter is well spread. People sometimes like to make stuffing to put inside the turkey but there are also many horror stories about doing so because of bacteria or how much longer it takes for the turkey to cook. To avoid doing so but to still give the turkey a great taste, you can fill the cavity with halved lemons, the remaining whole garlic cloves, and one half of the remaining herbs (1/3rd of the original amount). Wash your salt pork. Pre-heat your oven to 325°F. 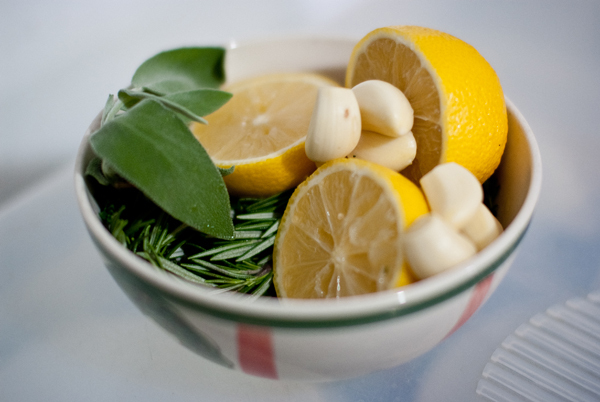 Fill the tray of a roasting pan with two cups of water and add the remaining herbs. 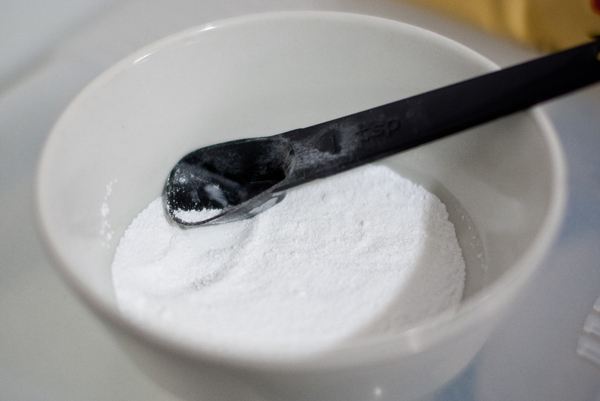 Mix the baking powder and salt in a dish, and then use that mixture all over the skin of your turkey. This will give it a nice brown when roasting. Next, use cotton twine to tie the turkey's legs together. You don't have to do a full truss here. Place the turkey breast down onto the roasting pan rack and arrange the wings underneath the breast. Lay your washed salt pork along the back of the turkey so that its fat/juices can keep your turkey moist; no basting necessary! Stick the pan in the oven. You're going to need a meat thermometer. For a turkey of such size, it will take you about 3.5 hours of cook time (if you need a timetable, check out http://allrecipes.com/howto/turkey-cooking-time-guide/). 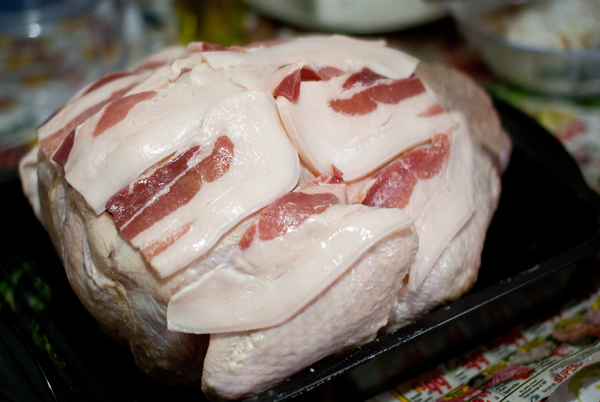 When the breast is at 130°F, remove the salt pork and flip the turkey over. Change the oven temperature to 425°F. You should have about 45 minutes left on the clock now. The final temperature at which the breast should be is between 160°F-165°F and the legs/thighs should be 170°F-175°F. 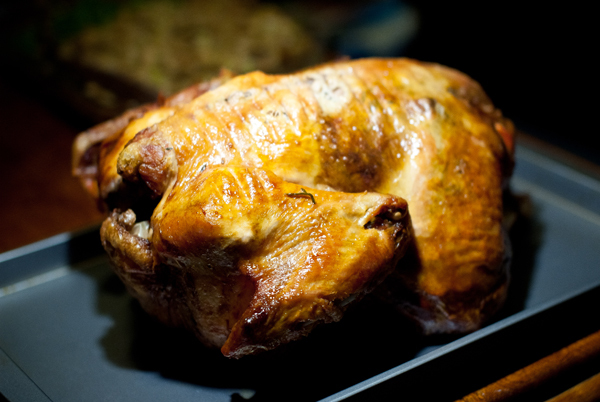 One of the important things to do when roasting a turkey is not to serve right away when you take it out of the oven! When the ideal temperatures have been reached on your turkey, take it out of the oven and let it sit for about 20-30 minutes before serving. Don't worry - it'll still be hot. You just want to let the juices of the turkey be spread throughout all the meat. Enjoy!